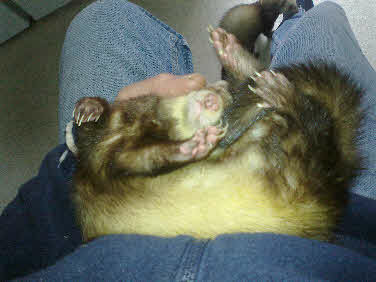 In 2014 one of two requests for the services of my vasectomised hob ferret Snowy to put jill ferrets out of season. Daisy was the first, a ferret at a rescue that had been the subject of an animal neglect case. I offered to give her a home when I realised what a sweet character she is. She is happily housed with Milly and Sandie. It has been observed (2015) that Daisy’s stomach was swollen, it was guessed that she has a cancer or a heart complaint. It is pointless putting her through invasive surgery, so she was prescribed a diuretic (fusimide) to reduce the swelling making life more comfortable for her. There has been occasions since when it was required for the fluid to be drained at the vet’s, up to 250 ml has been removed.